Each day is packed with activities, adventure, and opportunities to learn new skills. 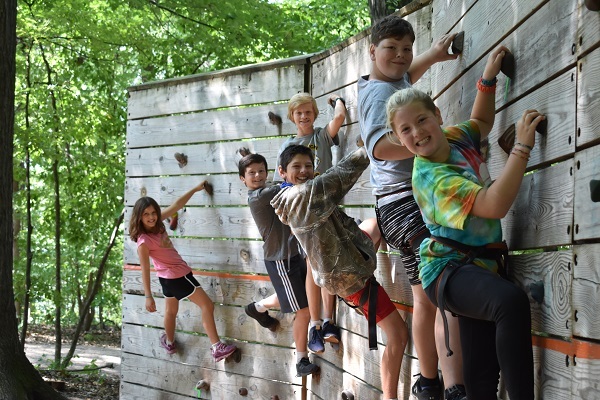 Campers enjoy a variety of activities including swimming, nature hikes, arts and crafts, boating, climbing, target sports and more. The week includes all-camp games, evening campfires, and outdoor exploration with cabin groups, target sports, drama, field games and more. Each camper will also experience an overnight in one of our treehouses, yurts or platform tents around the island. Campers end their day sharing stories and planning their adventures for tomorrow. Perfect for the first-time camper, the Summer Sampler gives new campers the opportunity to try a little of all that camp has to offer including swimming, arts and crafts, archery, gaga ball, a cabin cookout and much more. It’s such a great sample of camp that they’ll want to come back for a whole week next year! Please note, bus transportation is not available midweek. Two week campers participate in many typical camp activities like swimming, arts and crafts, archery, boating and similar to our Traditional Campers, they also receive an introduction to our trail program. Instead of a one night overnight experience our two week campers experience a 2 night overnight at a neighboring State Park and learn a bit more about outdoor cooking, wilderness skills, camping etiquette and participate in a Junior Ranger program.